The SSG has a wide range of responsibilities including maintenance of the departmental server infrastructure and computer labs, providing desktop support to faculty, staff, and students in the department, providing support for research computing needs, hosting common services, managing lab access, managing the departmental website, information security, and checkout equipment. Email is the preferred method of communication to ensure all members of the IT Support group receive the message. The IT support group hosts a wide variety of infrastructure for use by the department for teaching and research purposes. The department has access to the below listed research resources through the LAS Research IT group. Access can be requested through researchit@iastate.edu or by completing a webform. 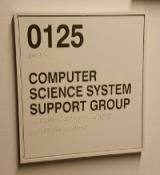 The IT support group operates 6 lab spaces with over 125 workstations in Pearson Hall, as well as a virtual Linux lab. Students have access to a large amount of specialized computing equipment for projects, such as laptops, iPads, Xbox, etc.